St Mary’s Church is part of the benefice of Barby and Kilsby. It is part of the Daventry Team Ministry and is in the Diocese of Peterborough. The church dates from Saxon times and stands at the centre of the village as it has done for centuries. The present building dates from the medieval period and has seen a number of changes and renovations over the years. In the late 19th century an extensive restoration was carried out under the auspices of the Rector the Rev. Mitchison, and most recently (in 2010) the exterior stonework was repointed and many stones replaced. The village community responded magnificently to the appeal “ Save Our Stones” and more than £100,000 was raised in a year. 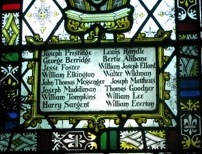 At the time of the Victorian restoration new stained glass windows were put in; most of these were made by Charles Kempe, a renowned exponent of the time. To download a short history and points of interest in St Mary's Church click here. 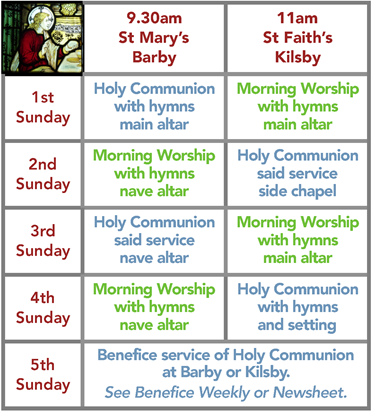 The church holds events throughout the year to which we welcome all villagers and those from further afield. Special services include a very popular children’s Carol Service on Christmas Eve and a school leavers service to which all the school comes. 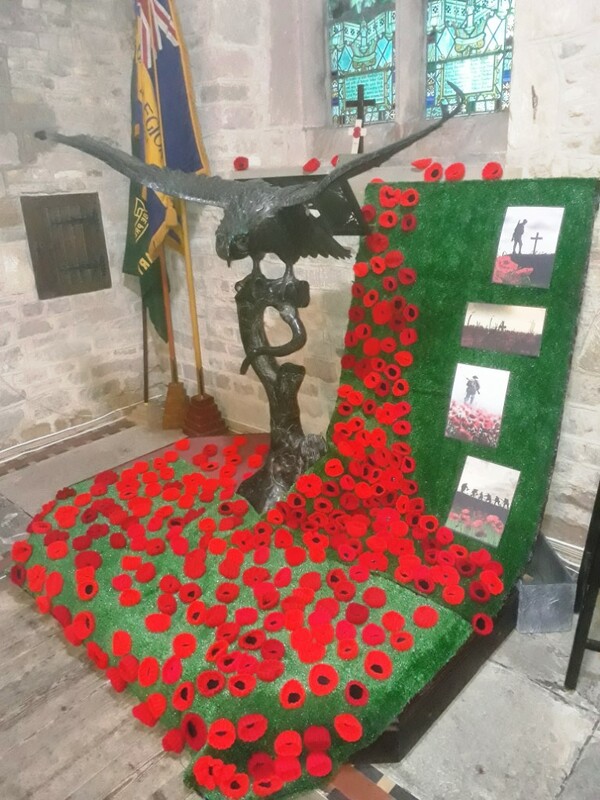 In addition we hold the usual Harvest Festival and Remembrance Day services. There is a ring of five bells. The team ring at the 10.00am services and on special occasions. Practice night is Monday at 7.15pm and anyone wanting to learn can come along then.A fifth bell, known as the Jubilee Bell, was installed in 2002, to commemorate Queen Elizabeth II's Diamond Jubilee. 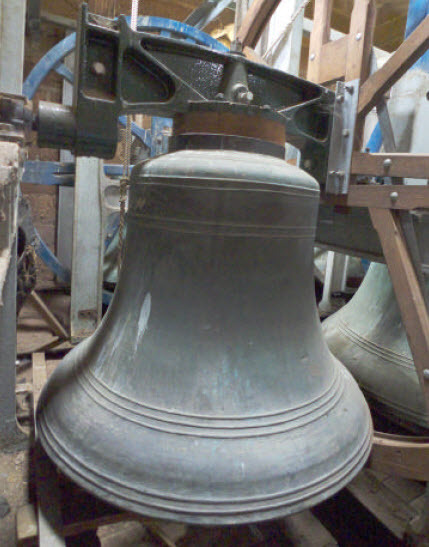 The money for the bell was raised by events organised by the bellringers and donations from villagers. For further information download more photos of the bells. St Mary's group of enthusiastic amateur flower arrangers make sure that there are always fresh flowers displayed in the church throughout the year. For weddings and other special occasions they enjoy the challenge of decorating the whole church. If anyone is having a celebration in the church the "flower ladies" are available, at a realistic cost, to provide a glorious floral display. Please contact Hazel Parsons (01788 890178), Jeanette Massie (01788 891472) or Pat Webb (01788 890800). St Mary’s has a small choir and welcomes new singers. The choir has sung in concerts and at the Diocesan choral festival. Following the two separate thefts of lead from the Church Roof we are now aiming to raise £30,000 to replace the two sections of roof with terne-coated steel instead of lead. Whilst the colourful tarpaulins are valiantly trying to keep the rain out we need to replace the roof as soon as possible. Please help us to preserve this grade II* listed building. Barby Church Trust was created in 1979 and is registered under the Charities Act 1960 (No 277482). It's objective is to raise funds to help cover major expenditures on the building fabric of St. Mary' Church. Ancient buildings such as St. Mary's enhance village life but require on-going attention. In 1996 the stonework of the tower, together with lead and other stonework, was restored. In 2010/11 there was a major appeal (strongly supported by, but separate from the Trust) to finance repairs to the stonework to the rest of the external stonework. Additionally, electric storage radiators were installed in 2000 and in 2013 major electrical repairs and upgrades were carried out. In 2015 repairs to the stone and wooden floors have been undertaken with the most worn parts of the stone flooring and areas of rotten wooden flooring being replaced. The Church Trust has financed much of the on-going expenditure to the fabric of the Church since its creation in 1979. It has done this mainly by organizing fund-raising events in the local community. To view the 2017 accounts click here. 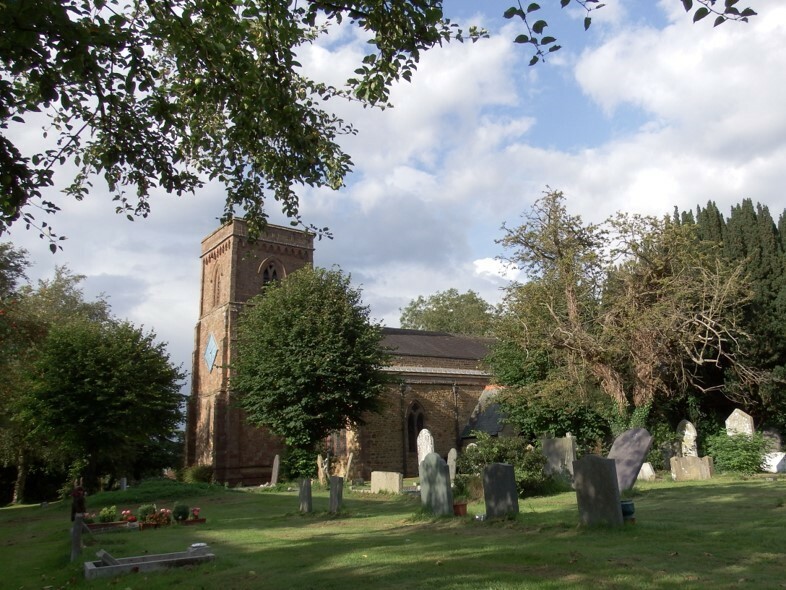 Barby Church Trust have started a "100 Club" to raise funds to improve the facilities to serve refreshments in St Mary's Church and also provide a disabled toilet. The Club is expected to run for 2 years starting in April 2018. Full details are contained in this invitation letter and the full rules can be downloaded here. Contact Chris Smith (Promoter) (01788 890963) or Rob Close (Treasurer) for more information. If you would like to support the work of the Trust please speak to any of the Trustees. Reverend Nigel Fry was appointed as Team Vicar within the Daventry Team Ministry with special responsibilities for Barby and Kilsby Parishes in April 2016. All enquiries regarding Baptisms, Weddings, Funerals and the need for Pastoral Care should be made to Rev Nigel Fry. Many of our parishioners ‘help out’ in church as sidesmen, readers, choristers, bellringers. There is also a need for help with roles ‘out in the community’ such as visiting the sick, both at home and in hospital and supporting the bereaved. If you would like to know more about any of these roles, then please speak to either Reverend Nigel or our Churchwarden. Download St Mary's Data Privacy Notice on personal data held by St Mary's PCC. Christmas and Easter services along with other special services are advertised in the church newsletter and on this site.